The authors are postponing due to a scheduling conflict. We will work with the authors to reschedule. 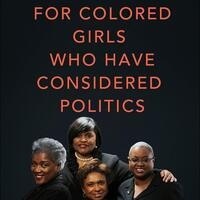 For Colored Girls Who Have Considered Politics is a sweeping view of American history from the vantage points of four women who have lived and worked behind the scenes in politics for over thirty years―Donna Brazile, Yolanda Caraway, Leah Daughtry, and Minyon Moore―a group of women who call themselves The Colored Girls. Like many people who have spent their careers in public service, they view their lives in four-year waves where presidential campaigns and elections have been common threads. For Colored Girls Who Have Considered Politics is filled with personal stories that bring to life heroic figures we all know and introduce us to some of those who’ve worked behind the scenes but are still hidden. Whatever their perch, the Colored Girls are always focused on the larger goal of “hurrying history” so that every American ― regardless of race, gender or religious background ― can have a seat at the table. Presented in partnership with Maryland Institute College of Art.